Are you a R.A.P. (Really Adventurous Person)? If so, join the club! What do French fry contests, bullet ants, and the lost art of umbrella combat have in common with dead pirates, island treasure and an excoriated Titanic survivor named Sir Cosmo Duff Gordon? A ten year old boy from New Jersey finds out when he travels to Peru by way of an underground tunnel that magically connects the cellar of his house to the basement of the South American Explorer’s Club, an eccentric and possibly haunted establishment chock-a-block with bones, stones, tusks and teeth. $14.95. 8 & up. Adventure. Magic. Travel. Archeology. History. Scotland. South America. New Jersey. FREE club tattoo included! Along with a removable map of Peru, an official membership card, and a handsome fern green bookmark, each copy of The Rapscallion Club comes with a temporary tattoo. 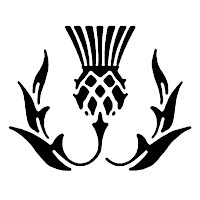 Applied to your shoulder or forearm, this attractive thistle tattoo will be sure to excite the envy of even your squarest friends. FDA approved. Instructions imprinted on back of tatt. R.A.P. Club Kits! The R.A.P. Club Discovery Kit & Box of Wonder contains over a dozen old fashioned toys (marble nets, magic sets), fully functioning adventure accoutrement (pocket flashlights, camping compasses), official Club swag (buttons, membership cards, temp tattoos), and various other items (authentic Peruvian coins, mini dino skulls) related to novel, which is also included (natch). All housed in a limited edition vintage cigar box. Kits retail at $40.00. PLUS: Read the book and match each item to its corresponding line of text, then send the list to info@rapscallionclub.com and win a prize even more wondrous than any of the items contained within! ATTENTION: BOOKSELLERS, LIBRARIES, AND SCHOOLS! 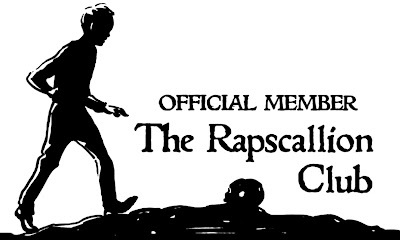 Those interested in purchasing multiple copies of The Rapscallion Club should contact raconteurbooks@gmail.com. Use "RAPSCALLION CLUB" as the subject heading. 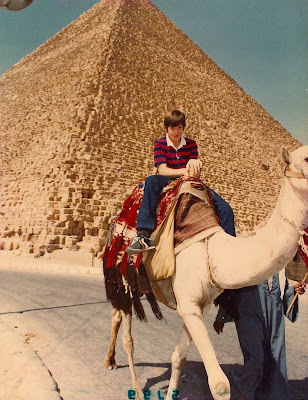 The author, age 10, on his own archeological adventure in Egypt. A licensed Central Park carriage driver and a certified international tour guide, Alex Dawson has worked variously as a bartender, bouncer, carpenter, set designer, and playwright. From 1998 - 2003, he was the artistic director for the award-winning Manhattan theater company Bon Bock Productions, during which time he wrote and designed fifteen plays for the New York stage. From 2004 - 2012, he owned and ran the late and legendary Raconteur, a bookstore in Metuchen, NJ. Dawson has an MFA in creative writing and literature from Bennington College. 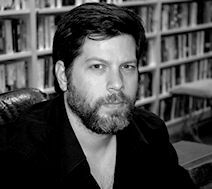 He teaches creative writing in Middle Grade & YA Fiction at Rutgers University and Multi-Genre Writing a the Middlesex Arts High School. He's currently at work on an adult short story collection called "The Beast of Bourbon Flip." This is his first novel. 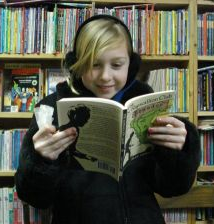 Emma engrossed at The Raconteur.